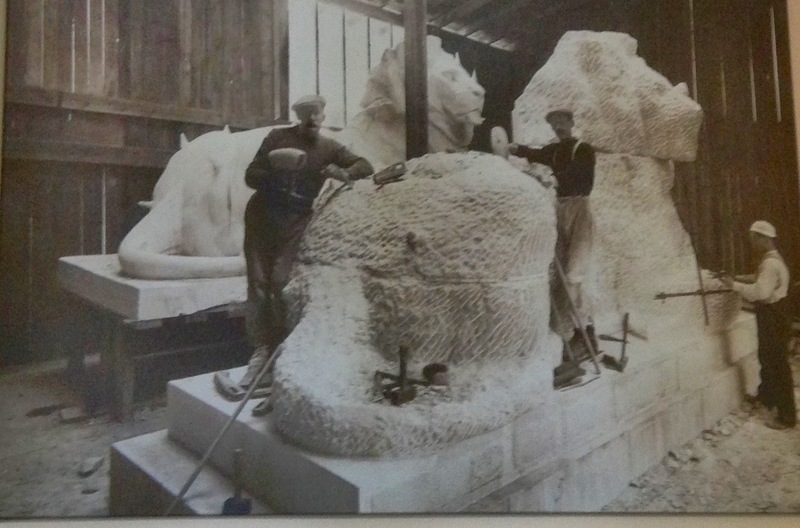 The sculptors stood next to a stone lion composed of two blocks forming a regal pose. The older man leaned against the immobile flank poised for the next chisel. The younger appeared in mid-stroke as he glanced up at the camera while an assistant seemed to be measuring the plinth. A second lion, serving as part of the sculpting process, completed the tableau. A black & white photograph captured this scene, one which caught my eye as I waited for a glass in the breakfast room of our inn, Demi Lune. When Greet, one of the owners, returned I asked her about this large photograph, and she began to tell me a story that her husband, Peter, finished the next morning. Most visitors know this town as a landmark of WWI, one completely destroyed and later reconstructed based on historical plans. Yet, Peter spoke of a much older history of this area beginning with the Romans raiding the Belgae people during the 1st century. By the way, the town’s name came from the Belgaes’ word “Iep”, their name for the elm trees, which grew along the banks of the river “Ipre” or “Iepere”; so, it was a natural progression to name the settlement along the river: Iper, which was altered by the Romans to “Ypra”, the latin derivation. Located along key transportation routes including easy access to the coast and England’s wool, Ieper began a lucrative trade in textiles. By the 13th century, it became the third largest city in Belgium after Ghent (Gent) and Bruges. Guilds formed to support the trade resulting in the construction of the magnificent Lakenhalle (Cloth Hall), a dominant feature of this medieval town (Ghent and Bruges were the only other Flemish cities featuring this symbol of prosperity). Built of stone, Ieper’s Lakenhalle provided a safe storage for both imported wool and the finished cloth stowed for export. However, the stone building also provided a habitat for those furry animals called rats. To help reduce the rodent population cats were introduced. This created another problem at the end of the season when no wool or cloth was stored resulting in a heavily reduced rat population and an over-abundance of felines. So, a tradition began that occurred on the last day of the annual fair (Cat Wednesday): cats, also considered evil spirits, would be bundled into burlap bags and tossed from the hall’s bell tower by the city jester. Thankfully, this tradition stopped in 1817 only to be reinstated in 1930, but the meowing sack is now replaced with a furry, inanimate object. If you’re interested, you can experience this festival every three years (next one is 2018). And, if you’re wondering about cat karma, just think of how the bubonic plague spread. Ieper experienced an economic decline in the late 1300s due to the annihilation caused by the Bubonic Plague roaring through Europe and to the effects of a devastating siege in 1383 waged by an English bishop (yeah, really, he was a ‘holy’ man). But, I’m only mentioning this decline because of that ‘the world is a small ball’ moments: In 2014 I saw a special door at Canterbury Cathedral for the Flemish weavers who headed over to England and started a competitive cloth trade. Due to the economic benefits of these immigrants, the rulers and religious heads allowed them to open a church in the underbelly (crypt) of the cathedral. Another example of how the threads of history weave together, the warping and wefting of time flow through the loom of life, lives intertwine amidst the carpet of the earth… Okay, I’ll stop. Ieper attracted the attention of power-hungry forces way before the Germans tried to take it in 1914. 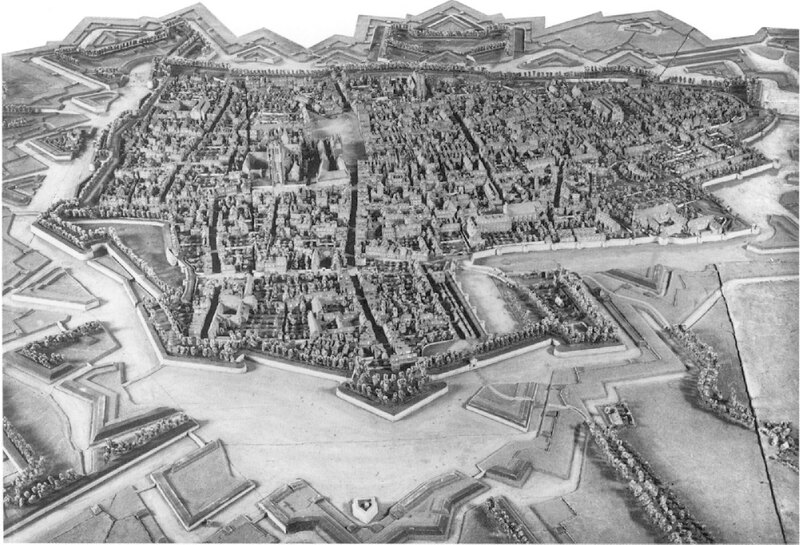 Eventually earthworks morphed into stone fortifications, some built under the direction of the famous French military engineer, Seigneur de Vauban, after King Louis XIV (1638-1715) invaded and overtook the city in 1678. Below is a mock-up commissioned by the French king in 1701. Peter, who can trace his ancestry back 16 generations, told me how the sculptors were his great-great-grandfather and his great-grandfather, Alphonse and Josef Pollee. He pointed out how the work was being done on top of the gate to avoid any difficulty placing the lion in its final position when completed. Peter also mentioned how his great-grandfather took off on a new motorbike to see the coast only to be fired upon his return. The reason? His father felt his son should have been marching in the May 1st Socialist Parade. The two lions survived the shelling with some damage but intact enough to maintain a regal presence. In 1936 these limestone sculptures were donated to the Australian government in gratitude for the sacrifices that country made during WWI. They were placed in the Australian War Memorial and later repaired in the late 1980s based on historical photographs. In 2014 they were loaned to the Canadian War Museum in Ottawa along with the 1927 painting of the Menin Gate Memorial by the Australian war artist, Capt. William Frederick Longstaff who served in WWI (this painting is at the top of this post). In 2017 the lions will be returned to Ieper for commemorating the 100th-anniversary of the Battle of Passchendaele. I found it quite astonishing that we were meeting the grandson of sculptors who had their hand in honoring those who had fallen during WWI. 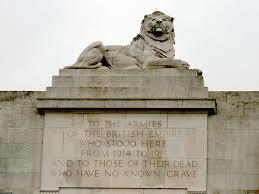 Their lion sat in repose atop Menin Gate, the memorial constructed in 1927. Yet, Max and I discovered even more of a connection between our hosts and the war: the photographer of the iconic photo of Peter’s sculpting ancestors was none other than Greet’s great-uncle, Daniel Pynck. As a young boy, Daniel lived with his family in Ieper. It was here, during WWI, where he lost his leg when a shell struck their home. His brother was killed and his mother and sister, wounded. Daniel was transported to a hospital on the coast to recuperate. An English nurse then took him to England while the war raged throughout his homeland. and began a successful career, being one of the few photographers in the area (we noticed his photo credit in an exhibit at the Flanders Field Museum). The store only recently closed but the building still stands, yet another landmark in Ieper’s history. Peter and Greet also shared with us the historical significance of Demi Lune, the name of their B&B. Demilune, french for ‘crescent’, has several meanings: it’s the name for a crescent-shaped island standing in the middle of water that one has to cross to enter/exit a city gate (if you look again at the 1701 mock-up of Ieper you’ll see several of these demi lunes); it’s the shape of a half-moon, a time when one is suppose to sleep well; and, it means little croissant, one of those delicate, flakey pastries offered as part of your B&B breakfast. A perfect appellation for this inn. Thanks to Peter and Greet, our understanding of Ieper’s history stretched way before the devastation of WWI. If anyone is planning a visit to this town, it’s definitely worth booking a room at this welcoming inn, Demi Lune (http://www.demi-lune.be). And, if you can spend some time with the owners, you, too, will feel the breath of history. This entry was posted in 2016 11 BELGIUM, 2016 Winter Tours, Belgium, COUNTRY, Europe, WINTER TOURS on December 12, 2016 by margaretlynnie.